VCU played the role of Rocky in the city of brotherly love this afternoon, trailing the La Salle Explorers by six late in regulation before getting up off the mat and fighting back to tie the game, sending it into not one but two overtimes where the Rams would pull out the gutsy win, 97-89. Down six with 1:04 to play, Treveon Graham put the team on his back, scoring all six of the Rams final points in regulation including a game-tying layup with just under 10 seconds to play. The Freight Train continued his dominant play in the first OT, scoring six of VCU’s seven points, finishing the game with a career-high 34 for the Rams. In double overtime is was a snake in the weeds that eventually did La Salle in however. Senior Rob Brandenberg had been quiet throughout the night, scoring on just one possession before hitting two deep balls in 44 seconds to extend VCU’s 2OT lead to six with 1:56 to play. From there junior point guard, Briante Weber, would ice the game, hitting seven of his final eight free throws to put a bow on the victory for the black and gold. Despite the extended game, La Salle turned the ball over just 16 times against the Rams. VCU matched that with 16 of their own but out-rebounded the Explorers 47-40. Juvonte Reddic played a major part in that advantage, leading VCU with a game-high 15 rebounds including 10 on the offensive end. Many of those offensive boards turned into easy points for the 6’9 senior as a part of his season-high 27-point output. His partner in crime, Treveon Graham, added 12 more of those rebounds to finish with his beast-like 34 point, 12-rebound double double. Briante Weber was the only other Ram to finish in double digits, scoring 12 points on 2-6 shooting but connected on one of his two deep balls and hit those seven huge free throws to end the game. Weber added five rebounds, five assists and five steals in the win. 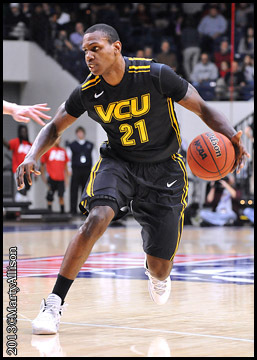 The defensive standout has scored at least 12 points in the last three games for VCU as well as in five of VCU’s last six. Outside of Weber’s strong finish from the stripe, missed free throws from the Rams helped keep La Salle in the game. The Rams were just 13-of-23 (56.5%) from the stripe during regulation. Treveon Graham had a chance to potentially end the game during the first overtime but missed a potential game-winner after making his first free throw to tie the game at 80. The win moves VCU to 16-4 and 4-1 in Atlantic 10 play. VCU will play their next three games within the friendly confines of the Stuart C. Siegel Center starting this Wednesday at 7PM against the Rams of Fordham University.